Tsintaosaurus is yet another addition to the Lambeosaur family's list of contraversies: discovered in 1958 in China, the fossil had an unwieldy bone sticking out from an odd angle. This was dismissed as being a sliver of the skull that had been moved out of place at some stage during its fossilization. Later, articulated fossils were found of Tsintaosaurus, showing that it may have had the projecting crest after all. Is it likely that all these fossils received the same damage at some point? Tsintaosaurus is very similar to another hadrosaur, Tanius, discovered in 1929. 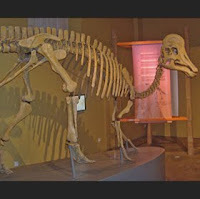 Its bill, so characteristic of the hadrosaurs, was thin in comparison to other dinosaurs', & it had a body very similar to the likes of Parasaurolophus, a well-known member of the Lambeosaur family. Of the scientists who argue that Tsintaosaurus did have a horn-like crest, these are divided into smaller groups who argue about the purpose of the crest. The one favorable theories are that the crests were highly colored & were used for identification concerning gender within the herd or status. It may have flushed with blood when the dinosaur was confronted or scared. Another is that the crest, being hollow, was used to make loud sounds by amplifying air blown through from the throat. This is supported by the fact that some Lambeosaurs have small bones in their ears, just like our inner ear, which most reptiles do not possess. This would have increased its sense of hearing tenfold, useful for an animal that would base most of its communication on sound. Other arguments put forth that the crest supported a sail, like the tall vertebrae of Spinosaurus, or ran blood close to hollows that led to the winpipe that would heat up & moisten air being breathed in.